” Closing the gap in Aboriginal and Torres Strait Islander health inequality unfortunately remains a persistent challenge for our society. There is no shortage of statistics and data demonstrating that we need to do better – it can sometimes feel like there is a new report every week flagging indicators of concern. The real challenge is translating headlines into consistent effort and real results – beyond news and political cycles. There is legitimate concern that the centrality of ACCHOs to improving health service delivery and health outcomes for Aboriginal and Torres Strait Islander peoples is not being adequately recognised. 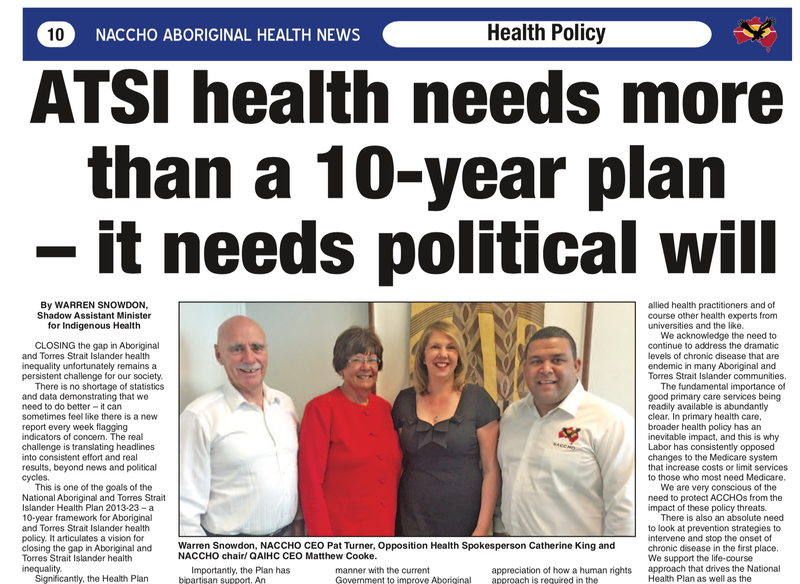 This is one of the goals of the National Aboriginal and Torres Strait Islander Health Plan 2013 – 2023 – a ten year framework for Aboriginal and Torres Strait Islander health policy. It articulates a vision for closing the gap in Aboriginal and Torres Strait Islander health inequality. Significantly, the Health Plan was developed by Labor in partnership with Aboriginal and Torres Strait Islander peoples, their community organisations and their peak bodies. 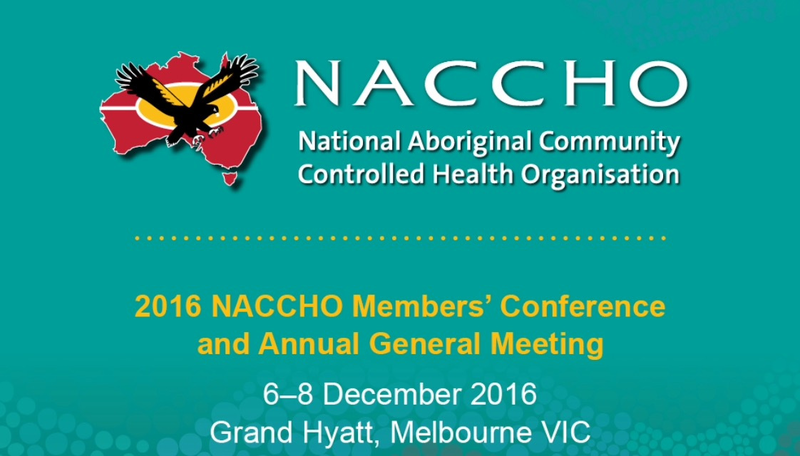 NACCHO was a key partner and collaborator in the development of the plan, as was the National Congress of Australia’s First Peoples. This is because Labor has a strong commitment to the belief that Aboriginal community controlled health organisations (ACCHOs) and the National Congress are central to improving health outcomes for Aboriginal and Torres Strait Islander peoples and should be partners in developing policy. Importantly, the Plan has bipartisan support. An Implementation Plan for the National Aboriginal and Torres Strait Islander Health Plan was launched in 2015 by the Abbott Government. Again, this plan was developed in partnership with the National Health Leadership Forum. However, despite this and the strong bipartisan support for the Health Plan, we are now in the fourth year of the Plan and still no resources have been identified for the Implementation Plan. It is clear that without resources, the vision of the Health Plan will be impossible to achieve. Although Labor remains committed to working in a bipartisan manner with the current Government to improve Aboriginal and Torres Strait health outcomes, to address the obvious inequalities and to close the gap, this does not mean that Labor will not hold the government to account. Advancing the priorities of Aboriginal and Torres Strait Islander peoples, communities and their organisations remains an absolute commitment. Working in partnerships is paramount to achieve these. There are obvious issues with the failure of the current government to develop a comprehensive approach to dealing with the social determinants of health or to demonstrate any real appreciation of how a human rights approach is required in the development of our health policy. Additionally, we are very aware of the need to address issues of racism to ensure that the health system is not discriminatory. There is legitimate concern that the centrality of ACCHOs to improving health service delivery and health outcomes for Aboriginal and Torres Strait Islander peoples is not being adequately recognised. I have consistently argued that there are ACCHOs which are the finest examples of comprehensive primary health care in the country. They are community based and controlled, they are responsive, innovative, accountable and have good governance. Most importantly, they deliver primary care, allied health services and prevention strategies which are examples for the rest of the world. ACCHOs also provide services that are culturally appropriate and safe. Having said this, there are some organisations that need to do better. They need to be more accountable and reform their governance and their record of service delivery. NACCHO and the state and territory affiliates have an important role to play in this regard in terms of leadership, accountability and mentoring. They need to be alive to the threats that exist as well as opportunities for the sector to grow further by expanding the reach of services and consequently, achieving better health outcomes for Aboriginal and Torres Strait Islander peoples. For our part, Labor will continue to review our current policy settings, particularly as we approach the next election. As a matter of course we will continue to work with NACCHO, the affiliates and their member organisations as well as other health advocacy and membership groups, such as doctors, nurses, health workers and allied health practitioners and of course other health experts from universities and the like. We acknowledge the need to continue to address the dramatic levels of chronic disease that are endemic in many Aboriginal and Torres Strait Islander communities. The fundamental importance of good primary care services being readily available is abundantly clear. In primary health care, broader health policy has an inevitable impact, and this is why Labor has consistently opposed changes to the Medicare system that increase costs or limit services to those who most need Medicare. We are very conscious of the need to protect ACCHOs from the impact of these policy threats. There is also an absolute need to look at prevention strategies to intervene and stop the onset of chronic disease in the first place. We support the life course approach that drives the National Health Plan as well as the requirement to address the broader social determinants. In this context we are currently giving priority to what can be done in maternal and child health, parenting and adolescent health. We need to ensure that all children are born healthy, have a healthy childhood and grow up to be healthy adults, without the chronic disease that has beset their parents and grandparents. Improvements cannot happen in isolation. There is a concurrent need to do something about the poverty that is such a major driver of poor health outcomes. Policies and strategies around education, employment, housing, drug and alcohol policies, mental health and social and emotional wellbeing as well as food security are integral to elevating and sustaining health outcomes. We will continue to advocate for the development and provision of appropriate aged care services. And we will continue to support treatment models driven by Aboriginal and Torres Strait Islander peoples that are culturally appropriate from their inception. Another area where Labor is keen to see more progress is in the health workforce. It is vital that we see more Aboriginal and Torres Strait Islander people across all disciplines, engaged in treating and supporting Aboriginal and Torres Strait Islander people. Labor recognises that one size will not fit all. There is a need to appreciate and address the difference and diversity that exists for Aboriginal and Torres Strait Islander peoples across the country. Labor is absolutely committed to both this underlying principle in our policy development process, as well as recognising that the framework we are using remains the National Aboriginal and Torres Strait Islander Health Plan 2013 – 2023. Another enews letter came through this morning of interest.